The third tourism awards celebrating the spectacular successes of the £2 billion industry in North Wales took place on Thursday 15 November. The glittering ceremony at Venue Cymru, Llandudno was organised by North Wales Tourism in partnership with Heart which represents more than 1,500 tourism-related members across the region. 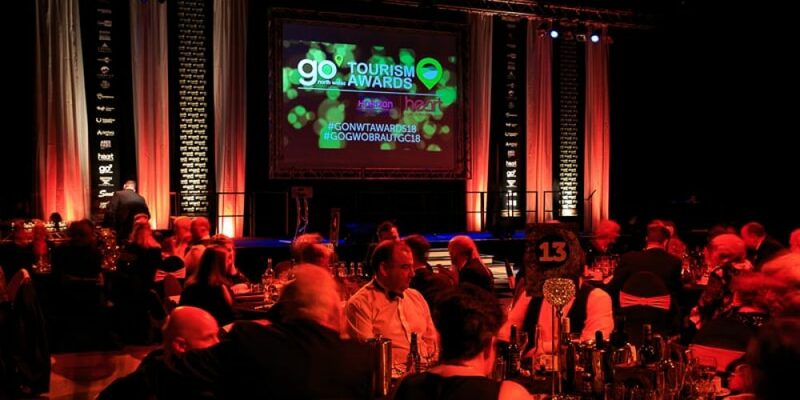 The Go North Wales Tourism Awards celebrate and recognise excellence and outstanding achievement by our businesses and individuals working in the tourism and hospitality sector of North Wales. Thank you to our main sponsor ‘Horizon’, and the many category sponsors. Without them we would not be hosting such an incredible evening. As always it doesn’t get any easier with continuous growth in our industry leading to a very tough selection process for our judges and this year was no different. Congratulations to all the winners, however in our eyes every nominee is a winner and all have played a part in what has been a successful year for Tourism in North Wales.